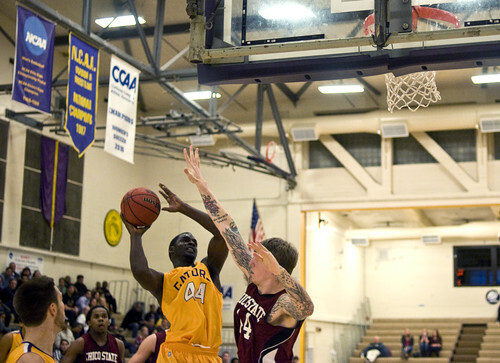 SF State forward James Albright (44) jumps for a shot against Chico State Thursday at the SF State gymnasium. Photo by Henry Nguyen. New advances have been made to SF State men’s basketball team as the squad embraces nine new faces, including three Division I transfers. Despite being new to the school, these latest additions have settled in and established themselves as a contributing force to the team. Griffin Reilly, James Albright and Casey James transferred to the Gators this year from Division I schools and have already had significant impact on the team’s success. Although their stories are very different, these players united because of their reason for transferring to SF State: they love to play basketball. The three players saw the transfer as a way to lengthen their playing time and continue their love of the game. At their previous schools, the three players didn’t get enough playing time. The Gators, who lost their home opener game against the Cal Poly Pomona Broncos, are on track to team success and unified play. The team had an early win against the Academy of Arts Urban Knights and a close loss to the Alaska-Fairbanks Nanooks in which Albright scored 32 points. Reilly had a season high of 21 points against the Simon Fraser Clan, and both players were named to All-Tournament teams at separate games. Albright is a junior from Oakland who transferred from Cal State Bakersfield. Trevor influenced Albright to join the Gators with the chance to play more and have a home at SF State. With only a few games as a Gator under his belt, Albright leads the Gators with 88 points. Reilly leads the team in minutes and rebounds, and James has a perfect shooting percentage from the free throw line. Although originally from Southern California, James has made the biggest transfer coming from University of Pennsylvania where he spent his first two years. James plays at guard while Albright and Reilly contribute to the forward positions. Reilly transferred from Loyola Marymount University as a marketing major. As a senior Reilly felt an added pressure to be a team leader and contribute to the team collective play. Reilly’s high rebound average has improved Gator defense, but all three players agreed that the team’s defensive ability needs improvement. James said in the last few games defense has been the team’s weakest area and needs development. The team is still learning to work together, but Trevor is comfortable with the progress the team has made. He recognizes that all the new faces brings talent, but also hard work as the team learns to work together by utilizing each other’s talents.